Building a successful e-commerce business can be quite a challenge. There is one aspect that contributes to that challenge, and that’s finding the right third-party platform on which to sell your products. It is possible to hire the services of a web designer to build one for you. However, third-party platforms tend to be more popular because they’re so easy to use. They also provide an opportunity to work within a community of online store owners. 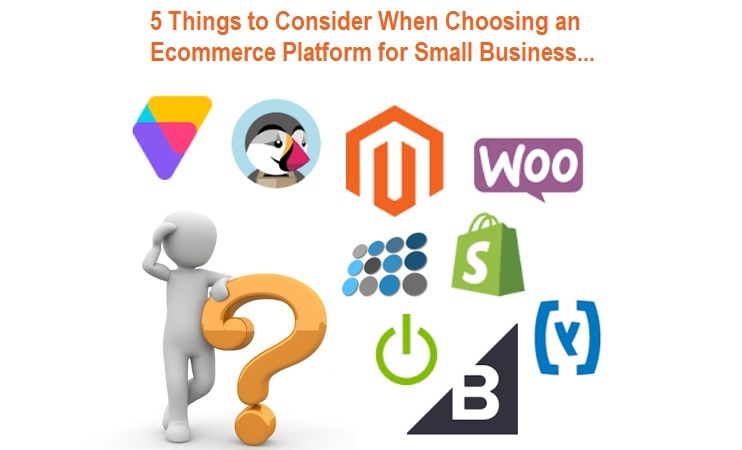 There are hundreds of different e-commerce platforms to choose from and a number of factors you have to consider if you want to find the best one for your small business. 1. How Much They Cost? Think of your choice of platform as an investment in your small business. Before you spend any money make sure you can support the cost of the platform. Find out whether there is a flat monthly fee, or whether you’ll be paying more depending on the choices you make with regards bandwidth, server storage, apps, plug-ins, and transactions. Think about the options you need for your small business and include all the relevant costs in your budget. Don’t believe the marketing hype and take some time to do your homework. Write down a list of questions and contact a sales rep for the answers. If there’s anything you’re not sure about, don’t be embarrassed to ask for a better explanation. It’s vital you understand what you’re paying for and that it fits your small business model. Ask questions about sending automated emails to customers, editing orders, and other basic details. The platforms can vary considerably, and there’s not a one size fits all solution. Most platforms include a range of different tools to help you run your small business. The needs of your small business will determine which tools are useful. There are a number of popular plugins you might want to consider. For example, an accounting plugin that helps with sales, taxes, revenues, and profits. An email marketing tool will also be useful if you want to keep in touch with customers. 4. Is It Mobile Friendly? Almost two-thirds of online searches are done on a mobile device. These searches often end in a purchase, so it’s vital your customers can access your website easily as well as make a purchase using a mobile device. If a platform isn’t mobile-friendly, you’ll be wasting your time and money. When you’ve decided what to dropship, you need to be certain that all your target audience can view and purchase your products. Spend time on making sure your website is mobile friendly in order to stand a chance in a competitive market. Running an e-commerce business means you have to rely on your platform provider to keep your store up and running. At any time there could be problems with the software, or server downtime. Both of which can impact on your brand image and your revenue. Choose a platform that offers support and a number of ways in which you can reach them. Also, consider what support is offered and how much it costs. One last consideration worth mentioning is security. None of your customers are going to want to provide personal information or payment details if your site isn’t secure. At the very least it should support HTTP/SSL for safe and secure checkout for your customers.